It’s probably not unfair to make the claim that most people who choose to watch a Ken Burns documentary know exactly what to expect going in: Uniquely American subject, “How’d they find that?” archival footage, talking heads both academic and first-person witness, masterful photography and editing, all in service to a solid (if uncontroversial) thesis. The Dust Bowl, Burns’ unsurprisingly exceptional 22nd feature, doesn’t stray from his well-established model. But, really, why the hell should it? Narrated by “Hey, that voice sounds familiar…” character actor Peter Coyote (The American Experience, Law & Order), a thorough examination of cause, effect and fallout from one of not just America’s but the world’s most disastrous ecological catastrophes. For those viewers tempted to consider the topic a reluctant reduction in scale from Burns’ other films, the history lesson alone is worth the four-hour investment of time and a telethon pledge. After post-Industrial Revolution and WWI USA saw our population expanding ever westward, audiences are quickly introduced to Cause: Zero oversight in the face of Suitcase Farmers (we would know them today as Vulture Capitalists) eager to quickly exploit vast real estate of prairie across eight states. Farmers eagerly borrowed to divvy up the land during a time of plenty, certain that hard work could overcome any number of long-term soil fitness problems. Wouldn’t you know: Crop prices tanked, bubbles burst … add in a drought and pestilence of positively Biblical proportions and, voila, the Great Depression. As one expects, the archival footage and photographs unearthed, coupled with riveting first-hand testimony, offer up a choice array of unforgettable imagery. It wasn’t just crops and livestock that perished; a legitimate health epidemic followed. Many people died, or had permanent ailments develop. Families were ripped apart. That the story doesn’t end with FDR’s solutions proposed in the New Deal (though they proved mostly positive), shows again how Burns is less a political animal than he is first a human being, endlessly captivated and reverent of the rich history of his neighbors. As with most any of Burns’ films you can name, The Dust Bowl deftly laces its narrative together with first-hand accounts and recited correspondence. As ever, the deeply felt human story within the larger agenda is never buried, but rather underscores the slow-burning argument beautifully. The carefully considered integration of these ground-level experiences tempers the pitch of the material to ensure the proceedings never come across as finger-wagging environmentalism. It’s tempting when trying to review a Burns piece to simply forego repeating all the established praise—still so very true—and just write: “Yes.” After all, when describing a documentary that can best be described as “an event,” it’s impossible for The Civil War, Jazz, and The National Parks to be far from mind. 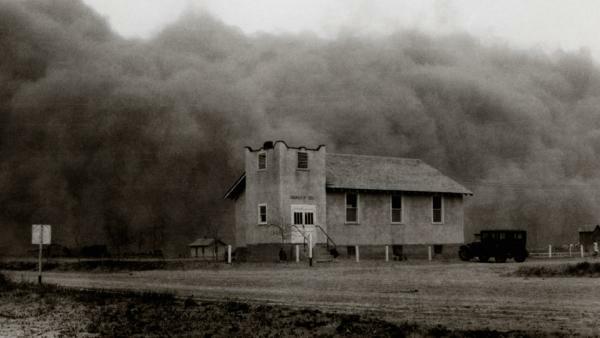 And, say, isn’t The Dust Bowl a Ken Burns film?